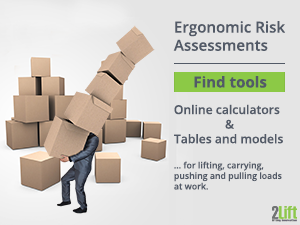 If you live in the United Kingdom and are looking for ergonomic guidelines and UK risk assessment tools for the manual handling of loads, you're in luck. 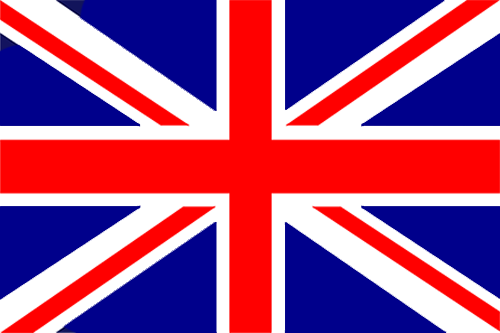 As a result of our research, we are tempted to say that in the EU (here before Brexit when the UK is still part of the EU), the UK probably has the largest amount of online material available for British employers seeking information on ergonomics and manual handling. 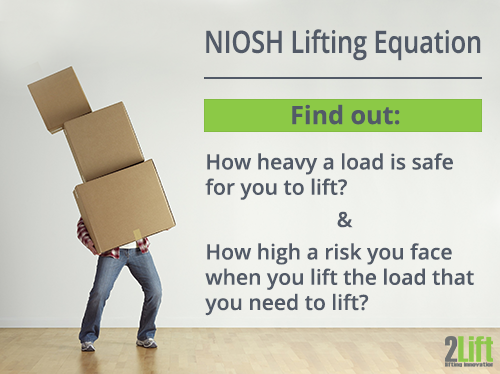 Employer guidelines on how to comply with the regulations for the manual handling of loads. But before diving into details of rules and regulations, let's take a helicopter view to see how everything is strung together in the UK. The UK has one of the longest recorded traditions for protecting people at work with roots going all the way to the 19th century. 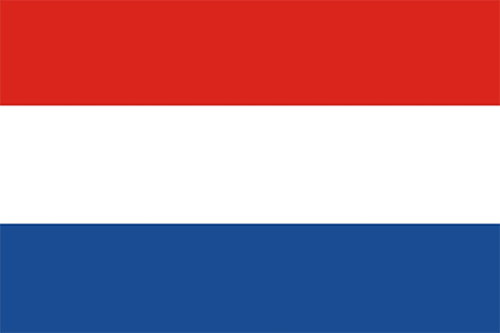 In the UK, EU-OSHA's national focal point is administered by the Health and Safety Executive (HSE), and is supported by HSE Northern Ireland (HSENI) and work together with various other national / social organizations and government departments. HSE describes themselves as an "independent regulator for work-related health, safety and illness." In other words, HSE is the agency responsible for setting the strategy and legal framework for everything health and safety-related in the UK, including that of manual handling. HSE's work consists, among other things, of creating public material for employers, so they can understand the level of risk to which they subject their workers, and how they may go about eliminating those risks. 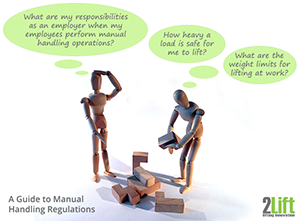 The most important document for employers to orientate themselves in is the HSE publication: Manual handling. Manual Handling Operations Regulations 1992. 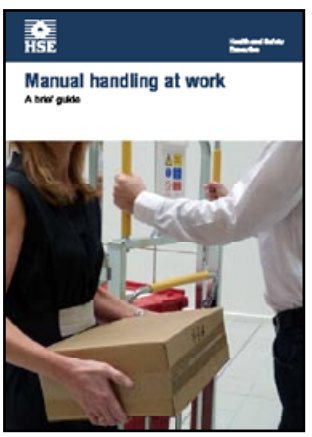 This document provides guidance for employers to help them identify, manage and reduce / eliminate the risks from the manual handling of loads at work. 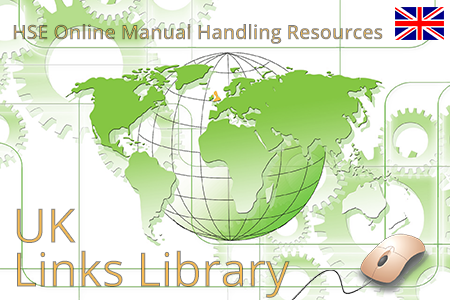 The manual handling tasks that you can read about are: lifting, lowering, carrying, pushing and pulling. A rather comprehensive document (the afore mentioned Manual handling. 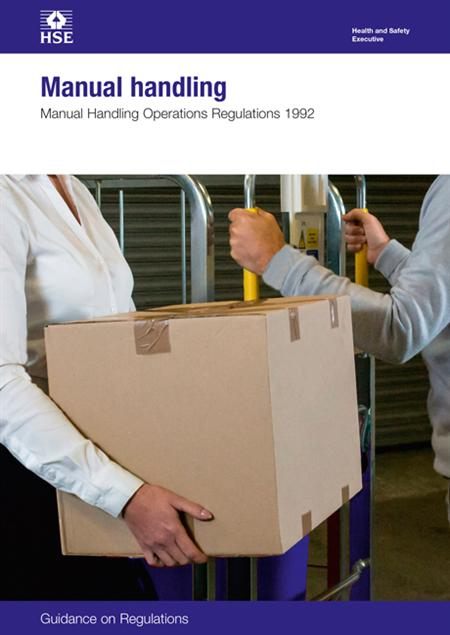 Manual Handling Operations Regulations 1992) intended for safety and health personnel and those employers who really want to deep dive into the subject. A short-and-to-the-point manual, Manual handling at work. A brief guide, ideal for those who just want the quick facts. Often step number one isn't quite possible, which makes risk assessment a necessary second step. If these risk assessments 'fail' (meaning there is a risk of injury), you need to consider other options such as mechanical aids. 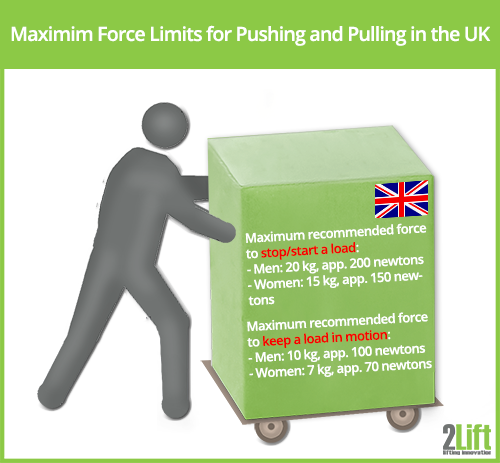 As you will discover in the above mentioned documents, manual handling is more than just weight limits. There are many other important risk factors to take into account, and that's the reason why ergonomic risk assessments often get very complicated. In most models there is an ideal (the most healthy way) way to carry out a lifting, lowering, pushing, pulling or carrying operation. That ideal creates a baseline with the heaviest recommended load or highest push and pull factors. If the manual handling task becomes more complicated (less ideal for the body), the recommended weight load and force factors will be reduced. For instance if you need to twist your trunk to grab an object at head height far away from the body, it shouldn't be nearly as heavy as one taken with a straight spine close to the body at hip height. 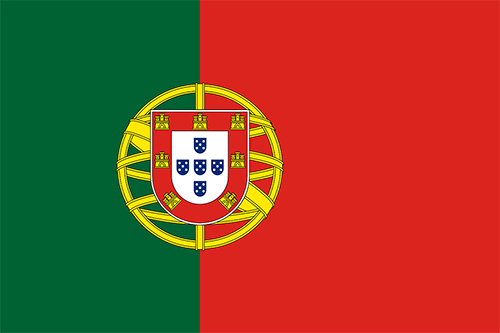 Thus, when other other factors come into play, such as e.g. trunk twisting and high lifting and lowering frequency, the recommended weight of the load should be reduced by certain percentage. Below you'll find the maximum force for pushing and pulling under ideal circumstances (e.g. level floors/no sloping etc). 20 kg for men (app. 200 newtons). 15 kg for women (app. 150 newtons). 10 kg for men (app. 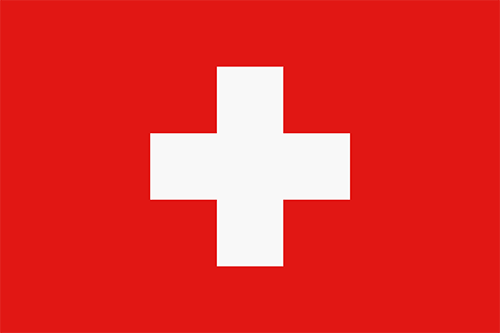 100 newtons). 7 kg for women (app. 70 newtons). All depending on the complexity of manual handling tasks, in the UK there are different ergonomic risk assessment tools you can use to find out if you are providing safe working conditions for your employees. Simple weight filter models for manual handling that is e.g. symmetrical and infrequent. You will e.g. find one page 54 in Manual handling. Manual Handling Operations Regulations 1992. 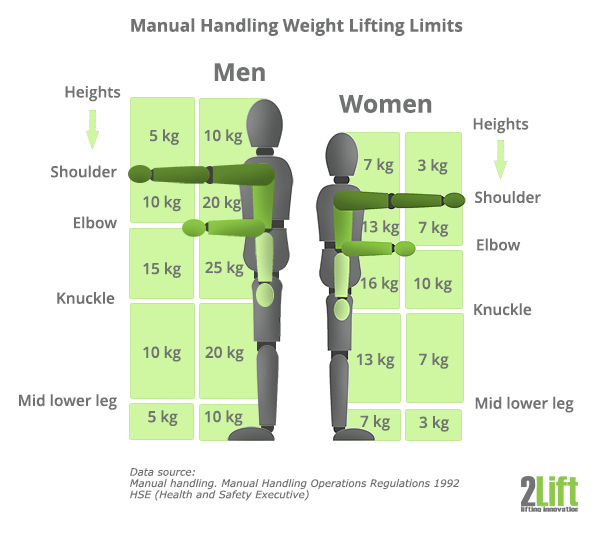 (It is very similar to our Manual Handling Weight Lifting Limits model above). A more comprehensive risk assessment can be performed using e.g. HSE's MAC tool. 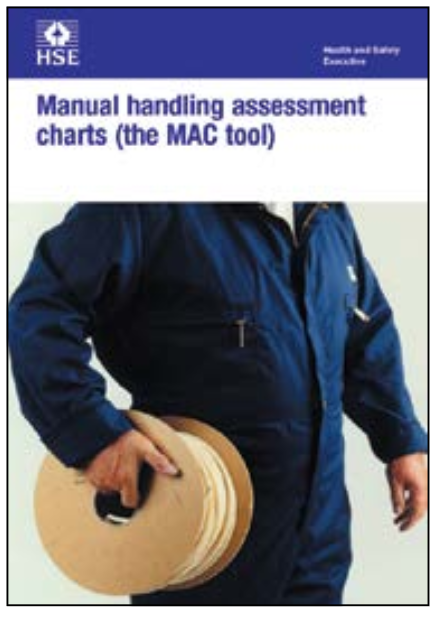 The MAC tool (The Manual Handling Assessment Charts) is a mostly used as a professional tool by safety and health managers, representatives and inspectors to identify manual handling operations that constitute a high risk. 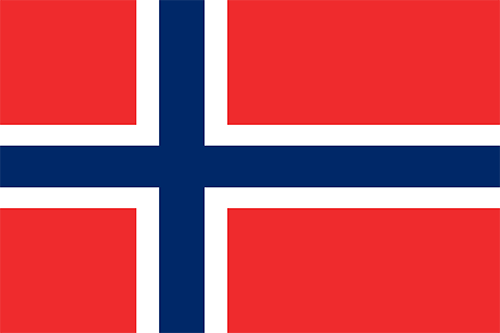 The MAC tool can be used for lifting tasks, carrying tasks, and team handling operations. 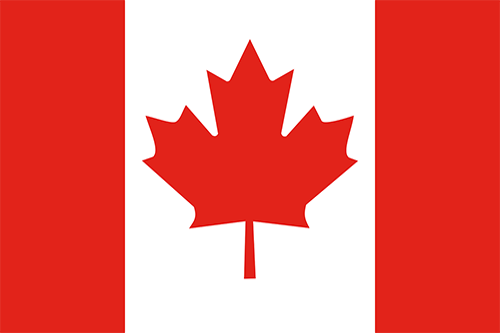 The MAC risk assessment section consists of a guide, a flow chart and a score sheet. 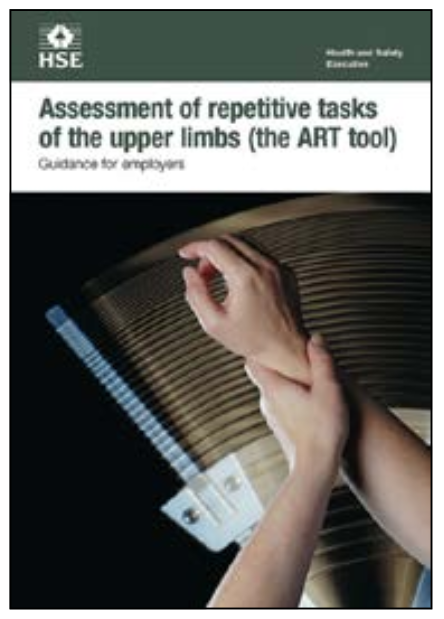 If the manual handling tasks are characterized by repetitiveness involving the upper limbs, the HSE also has a risk assessment tool for this called the ART tool (Assessment of Repetitive Tasks). 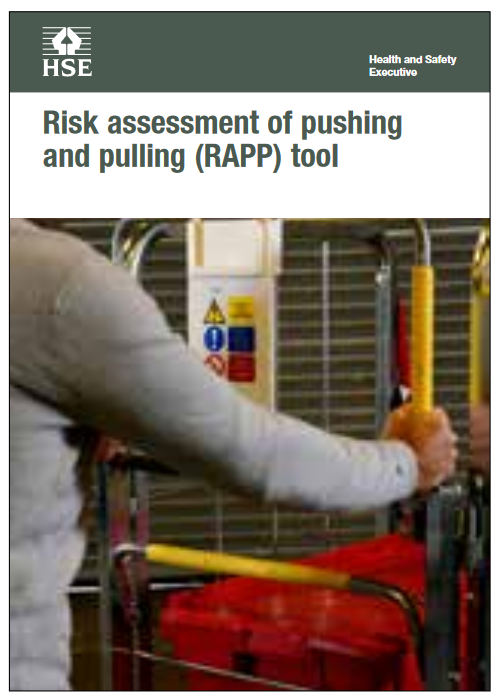 Finally, if your manual handling tasks consist of pushing and pulling, you'll find the RAPP tool ideal for that. A full manual handling risk assessment sheet with examples of how to fill it out: This full risk assessment can either be carried out on its own or in combination with the other risk assessment tools. 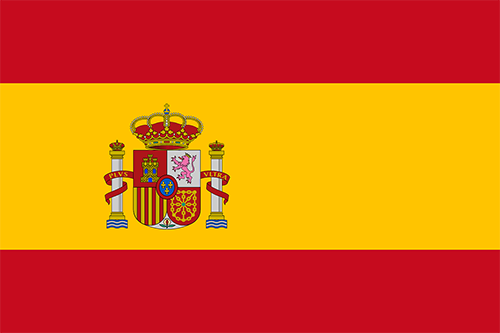 Information on work equipment and machinery. How to approach your supplier, what to be aware of when buying, law and regulations regarding machinery etc. Information on risk assessment with links to tools and other types of manual handling material. 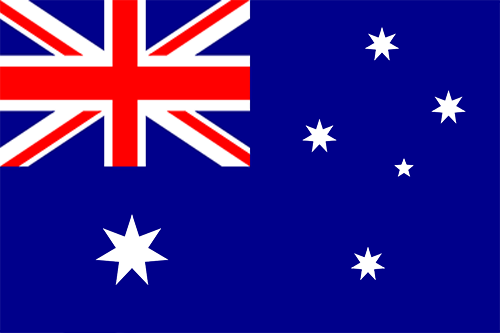 This page contains public sector information published by the Health and Safety Executive, which is licensed under the Open Government Licence. This notice applies to the illustrations for the following HSE publications: Manual handling. Manual Handling Operations Regulations 1992, Manual handling at work. A brief guide, the Mac Tool, the Art Tool and the Rapp Tool.